Close to 1 percent of all newborns each year in the United States, about 40,000, have a congenital heart defect, according to the Centers for Disease Control and Prevention. Most babies who would have died from complications of congenital heart disease now survive into adulthood because of advancements in surgical care. An estimated 1.4 million adults in the U.S. are now living with a congenital heart defect. Although many defects are treatable, congenital heart disease is rarely cured. Heart defects often reappear later in life. A congenital heart defect in an adult can at first seem like other diseases that affect the heart or lungs. The symptoms also can be attributed to aging or a sedentary lifestyle. Shortness of breath (especially during physical activity). Cyanosis (insufficient oxygen gives lips, skin or fingernails a bluish tint). If you experience any of these symptoms and were treated for congenital heart disease as a child, talk to you doctor. Pulmonary hypertension: High blood pressure in the lung’s arteries. Heart failure: When your heart doesn’t pump strong enough to supply the body with needed blood. Arrhythmias: Abnormal heart rhythms. The heart beats too fast (tachycardia), too slow (bradycardia) or erratically. Endocarditis: An infection of the heart’s inner lining. Stroke: When blood flow to part of your brain is blocked or a blood vessel ruptures in the brain. Heart valve abnormality: A heart valve repaired when you were a child might require additional surgery as an adult. Make sure your doctors and dentist -- researchers have found an association between congenital heart defects and poor oral health – know about your condition. Talk to your dentist or surgeon about possibly taking antibiotics before dental cleanings or surgery to reduce the risk of infection. Contact your doctor if you have any sign of an infection, such as fever, body aches or a sore throat. Congenital heart disease is a defect present at birth, whether in the heart’s interior walls, valves or arteries and veins. All of these defects affect the flow of blood through the heart. Sometimes a doctor discovers the abnormality during pregnancy. 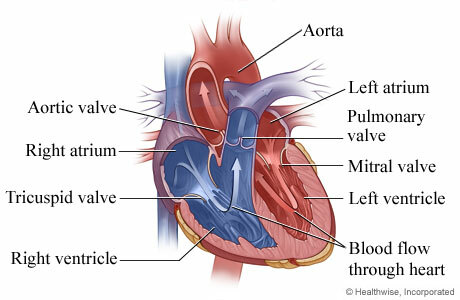 It usually develops soon after the formation of the heart’s two sides and the large blood vessels that transport blood. Some defects are genetic, or inherited, or related to another disorder such as Down syndrome. What happens during pregnancy can also cause a congenital heart defect in an unborn child: a pregnant woman taking certain prescription medications and exposure to diseases such as diabetes and German measles. In other cases, a congenital heart defect treated as a child could deteriorate as an adult. The defect also might not have been considered sufficiently serious during your childhood to require treatment but has since changed. Researchers have identified at least 18 distinct types of congenital heart defects. Holes in the heart: Some newborns have a hole in the septum, the wall that separates chambers on the heart’s left and right sides. This condition is referred to as an atrial septal defect. Valve defects: A valve that does not fully open (stenosis), leaks blood backward when the valve does not close properly (regurgitation) or the valve does not have a hole that allows the passage of blood (atresia). Defects in blood vessel location: The body doesn’t get enough oxygen with a defect in the pulmonary artery (carries blood to the lungs) and the aorta (carries blood oxygenated in the lungs to the rest of the body). Heart tissue defects: Can lead to heart failure. Heart rhythm defects: A rare condition that affects the heart’s electrical conduction system that stimulates the heart muscle into a normal rhythm helps blood circulate through the body. Depending on the severity of the congenital heart defect, your doctor will determine if it’s best to treat the defect directly or its residual effects. In either case, your condition warrants monitoring. Your doctor will want to see you regularly to ensure the defect hasn’t worsened. A procedure using catheters that repairs the defect without major surgery. Implantable devices (pacemaker or cardioverter-defibrillator).